When I need a break from Rome’s hustle and bustle, I head to the countryside. And when I’m there, I always stay at an agriturismo, or “farm-stay”—or Italy’s best-kept accommodation secret. Over the course of my travels in Italy, I’ve probably stayed in more than 50 different agriturismi. Not once have I been disappointed. Each one has had its own character, but they’ve all been comfortable, in beautiful settings, and a better value than any hotel. And no, you don’t have to milk a cow or collect eggs to stay at one. When I’m asked about my favorite agriturismo in Italy, though, there’s always one that comes to mind: Fontanaro. 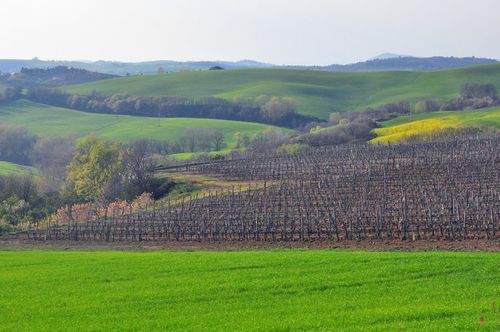 Fontanaro and its sister property, Tartagli, are located on the border of Umbria and Tuscany, a 2-hour drive from Rome (or a 1.5-hour drive from Florence). They’re a stone’s throw away from the tiny, medieval village of Paciano. 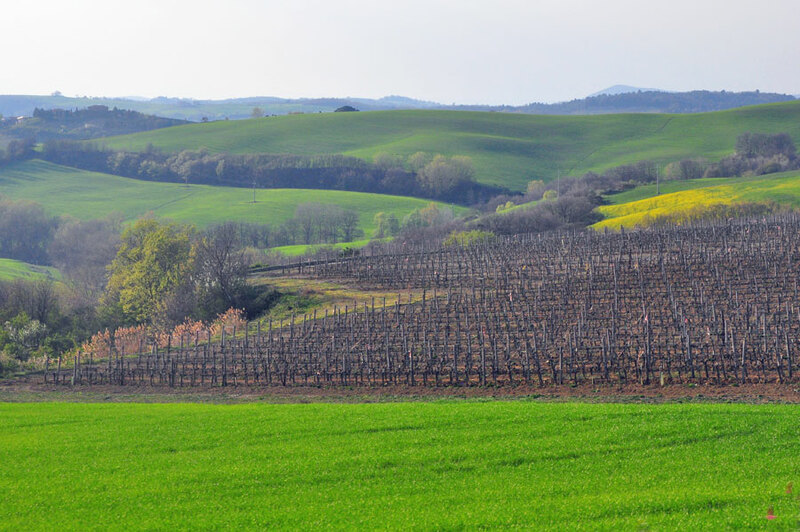 Made up of rolling hills and vineyards, the Fontanaro properties produce a huge variety of Tuscan-Umbrian staples, from olive oil to honey. Better yet, everything is grown organically. 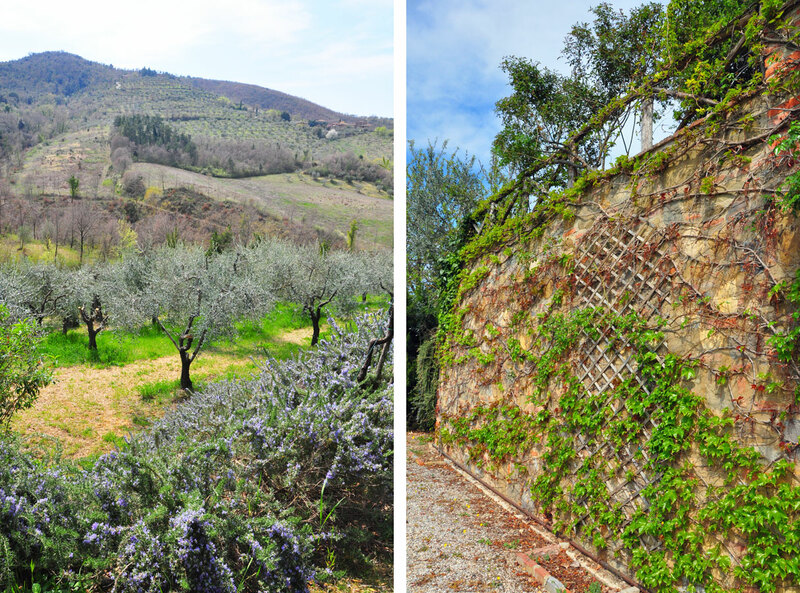 And the estate, run by mother-daughter team Lucia and Alina Pinelli, uses sustainable energy whenever possible; the farm was one of the first in Umbria, in fact, to use solar panels. Rome’s amazing every year. 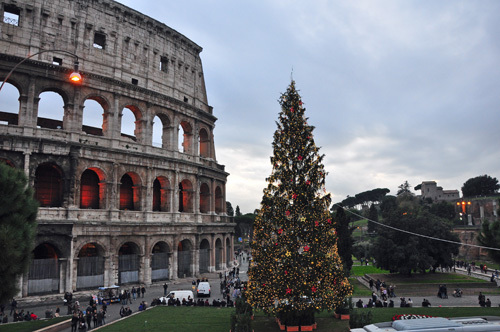 But I’m especially excited for 2013 in the Eternal City. 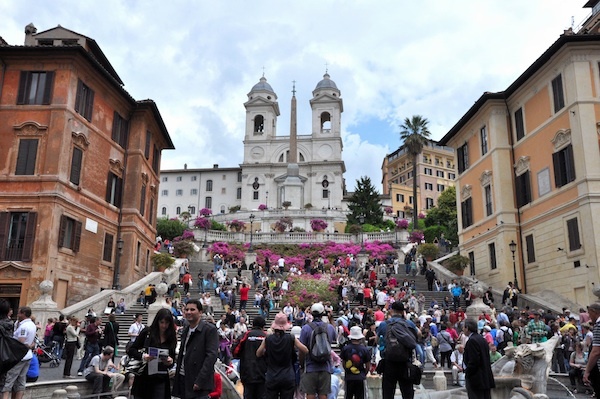 Here are six things on my “bucket list” for my upcoming year in Rome (and beyond)! 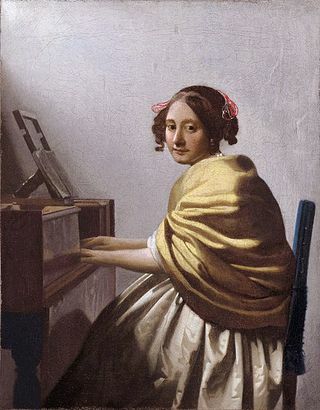 The Vermeer exhibition: on my list of must-dos for 2013! Compared to past years, 2013 has way fewer exciting exhibitions on. (Hello, financial crisis!). Still, there are some I’ve made note of in my calendar. Among them: the Vermeer exhibit at the Quirinale, which runs until Jan. 20, and the “Age of Balance” exhibit at the Capitoline Museums, which explores the era of the “good emperors” (Trajan, Hadrian, Antoninus Pius, and Marcus Aurelius), until April 28. 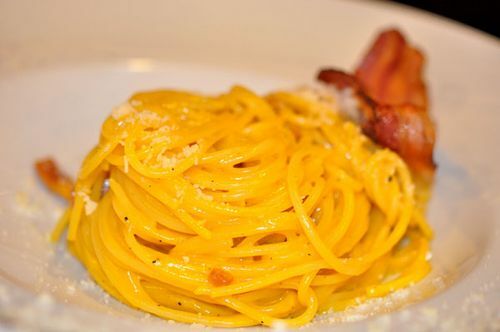 Food: From 2009 to 2013, one of my main reasons for loving Rome. These include new-ish spots (like Baccano, an aperitivo, brunch and bistro spot near the Trevi Fountain; Coromandel, a bakery/brunch spot/restaurant near Piazza Navona; and Romeo, an Alfa-Romeo-car-dealership-turned-restaurant by the Roscioli brothers and the chef behind Trastevere’s Glass Hostaria), old favorites that I (eek!) still haven’t made it to (like Monti institution La Barrique), and a couple of high-end spots that just got their Michelin stars (Metamorfosi and Pipero al Rex). Flash Sale on Italy Travel Chats: Only Until Jan. 1! 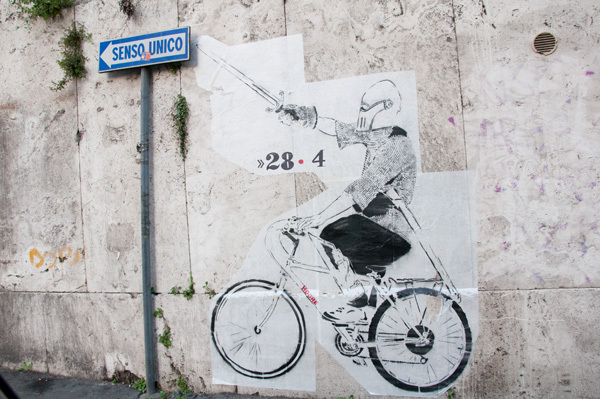 Coming to Rome? Then take advantage of the chance to pick my brain on everything you need to know! In honor of 2013 being, you know, the best year yet, I want to make it a little easier for anyone who wants to to pick my brain on travel to Italy. 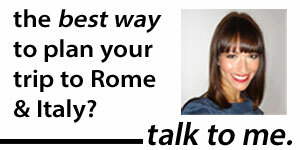 From now until January 1 at midnight EST, my one-hour, one-on-one Italy travel chats are just $60. Get all of your burning questions answered, plus a follow-up email with what we spoke about, lists of restaurants and shops I recommend, and more! So don’t wait—buy your session now (just click the button below)! (You can also buy it now and use it at any point in the next year, so if you’re not yet sure what questions you’ll have or are only just starting to think about your Italy trip, it still makes sense to save and buy a session now). I hope to speak to you in 2013! Tanti auguri di Buon Anno! Not gonna lie: At some points in the past year, I felt like this guy. At the end of the year, I always like to look back on what I did—or didn’t—accomplish. And I think it’s safe to say that, as much as I felt like it was impossible to “get it all done,” 2012 was a big year for Revealed Rome. So much of that was thanks to my readers and followers, who have helped me with ideas and support—and, not least of all, with the inspiration to keep going even when it all felt overwhelming. So a huge thank you. Seriously. I couldn’t have done it without you. Looking for an item that's handmade in Italy… and can be shipped abroad? You've come to the right place! For the fourth post in my Italian gift guide, I wanted to spotlight Italian artisans, whose work—whether in leather or mosaic, glass or ceramics—is some of the finest in the world. Gift-wise, there's something here for everyone, speaking to the incredible variety of output of Italy's artisans. Need something for a mother or female friend? Check out the beautiful baubles made of Venetian glass, including necklaces and jewelry. Looking for a gift for a hostess? A handpainted ceramic serving tray is a thoughtful gift. 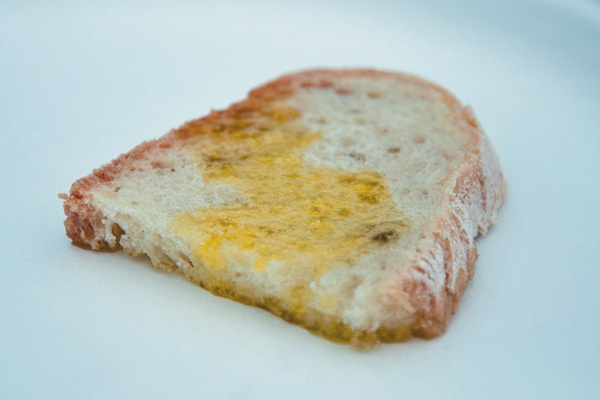 Want a memento for someone who visited Italy, and loved it? Any of these would do! Of course, many of Italy's artisans don't have websites, or don't ship abroad. I handpicked artisans from among the few who do. Some of their websites have online stores, where you can pay electronically; at others, you need to contact the owner to arrange payment. But aside from the slight inconvenience it might cause, the opportunity to buy a piece handmade in Italy, and shipped to you, seems worth it. Nota bene: Some websites are in Italian only. Just run them through Google translator to put them in your own language! Mosaic is an ancient tradition; on the Italian peninsula, the Greeks, Romans, and Byzantines all raised it to a fine art. Luckily, Italy still has artists today who are keeping the tradition alive, producing gorgeous, elaborate images—by hand. And guess what? Many of them do ship abroad. Ravenna is, without a doubt, the Italian (and perhaps international) capital of mosaic. 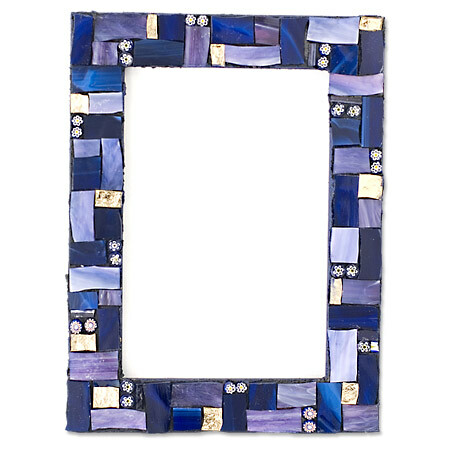 So what gift could be more special than a mosaic, handcrafted by a workshop in Ravenna, and shipped to you? 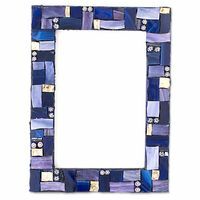 Remember, by the way, that a mosaic doesn't have to be a decorative image; it could be a picture frame, mirror, even jewelry. 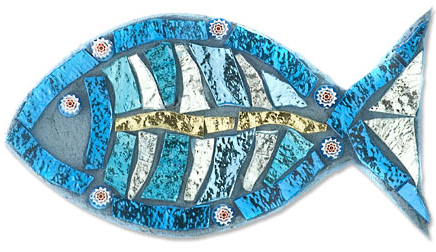 Anna Fietta creates such gorgeous, updated mosaics from glass, with a particularly large selection of picture frames, mirrors, and decorative animals—like this Tiffany-inspired picture frame (3.9 by 5.9 inches, just €35), shown right, or the whimsical fish, at top (4.3 inches, €22). Here's Anna Fietta's online store. Barbara Liverani handcrafts contemporary mosaics using Byzantine techniques. She has a number of mirrors and small boxes, and also—more whimsically—gnomes and letters. Spelling out "home" or "love" seems like it would be a particularly sweet gift. You can't just purchase her items online, but you can take a look at her gallery and email her if something strikes your eye. Of course (as per the point of this post! ), she ships abroad, including to the U.S. The island of Murano, off of Venice, is one of the most famous in the world for its glass. But there are countless Murano knockoffs (even on Venice itself, dozens of stores advertise "Murano glass" that's actually cheap, factory-made imports from China!). So if you want to buy the Italy-lover in your life a light-catching piece of Venice, make sure you're buying from an authentic Murano glass dealer. 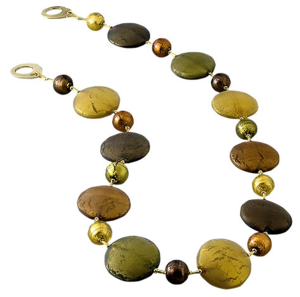 One authentic Murano workshop with items available online is Esse Due Murano, which has an especially excellent, and varied, collection of jewelry. The style is contemporary and stylish, and ranges from elegant necklaces like the one shown at right, €87, to items like these gorgeous drop earrings, just €18. Another is Ragazzi Murano, who have an online shop here (however, you still have to email them for price information and to place an order). Items include whimsical clocks, picture frames, and jewelry as well as vases and tableware (shown at top). Finally, for the ultimate variety (and ease of purchase), the online store MuranoNet is one of the few "big ones" I would trust. 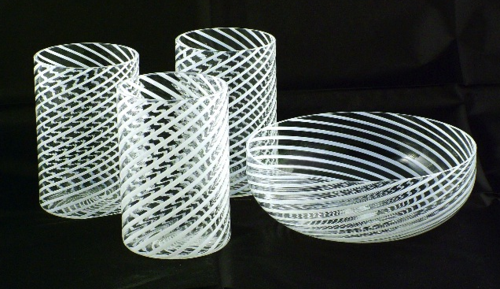 It's certified and trademarked by Venice's Murano glass oversight association, and all objects come with certificates of origin and authenticity. The store has everything from sculptures to jewelry to ornaments, and definitely worth checking out if you want the perfect Murano glass gift. Handpainted ceramics have to be one of Italy's finest artisanal traditions. And a pitcher, tray, or decorative plate, handcrafted in and shipped from Italy, makes a thoughtful gift for any hostess or homebody—especially one with a passion for Italy. 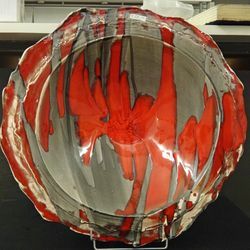 In Rome, my favorite ceramics workshop is Le Tre Ghinee, where ceramics artisan Susy Pugliese handcrafts contemporary, stylish plates, bowls, and more; many of her items are shown online, and you can order by emailing her. Located in the Chianti region of Tuscany, Rampini Ceramics, one of the finest and best-known ceramics workshops in Italy, produces handmade saucers, bowls, and more using traditional handpainting techniques. Designs aren't just traditional scenes of lemon groves and olive trees (though those are lovely, too—just check out the picture above! ), but also more-contemporary designs. They also sell gift sets, like a large pitcher and four mugs, all handpainted (€312), for a truly special gift. Ceramics artisan Sabina Pagliai is the artisan behind Ceramiche Bibi in Siena. 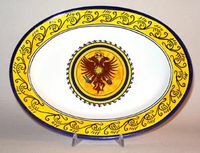 All of her creations are handmade, using unleaded colors; pieces include plates, vases, and trays, all decorated with traditional emblems of Siena and Tuscany. 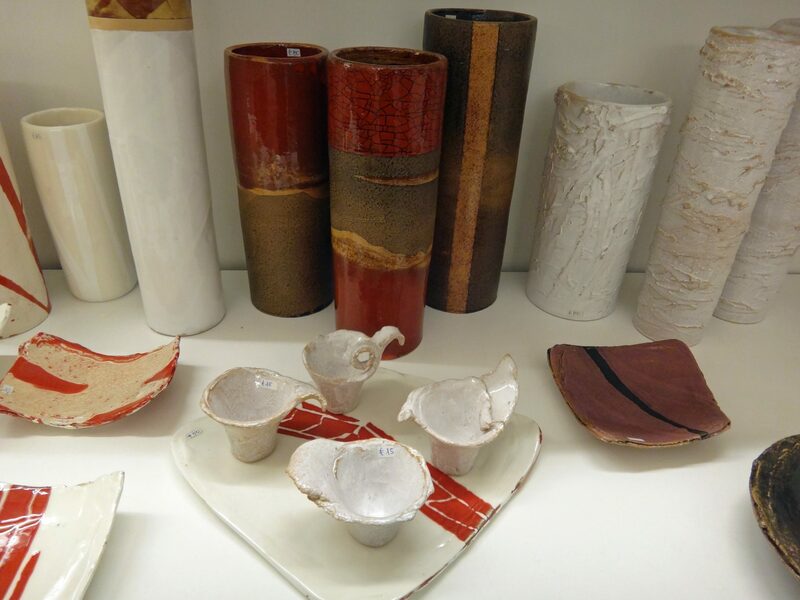 Since 1981, the workshop Poterie has handcrafted ceramics in Genova. Their artists specialize in decorative tiles and panels, including house number plates, with traditional Italian patterns of geometric shapes, fruits, and flora. The two women behind Artesia have been handcrafting, painting, glazing and firing gorgeousvases, bowls, plates, trays and more in Certaldo Alto, Tuscany since 1990. The prices couldn't be more fair: This 4.5 inch by 10 inch fruit bowl is €37, while this stunning 16-inch plate (shown left) costs €70.25. 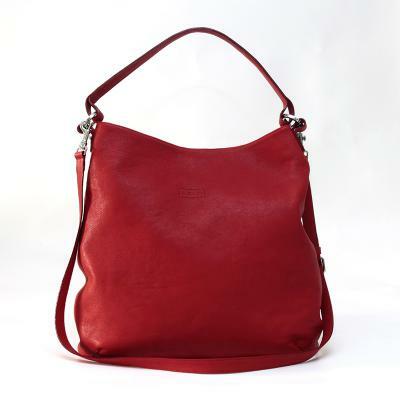 The family-run workshop La Dolce Vita has handcrafted leather accessories since 1980 in Buonconvento, Tuscany; now, you can buy their items—including beautiful bags for both men and women, like this red purse, at right, €145—online. Another leather workshop that lets you buy items online is Fandango, where every item is handmade in Italy. Their style tends to be contemporary and in-the-moment, and they have some great gift ideas, like a bright blue leather case for a MacBook Air (€85.90). The Bellavia store sells all handmade linens, including tablecloths, bed linens, and more. They ship abroad, and their online catalog is here. Since 1842, Tuscan workshop Busatti has been handcrafting fine fabrics using traditional procedures; every step of the process is done by hand and takes place in Italy, including dying, spinning, weaving, and finishing. From tablecloths to bed linens, towels to baby bibs, they have many of their items on their online store. 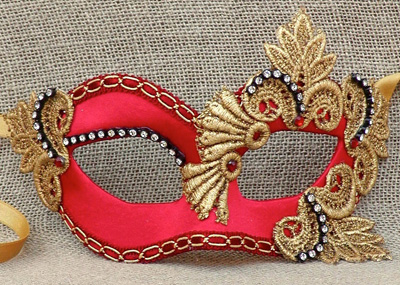 Despite being one of Italy's "newer" artisanal traditions (truly), Venetian mask-making is now the most popular on the island. 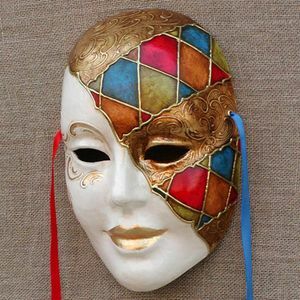 As with "Murano glass," though, many of these masks are cheap, manufactured abroad… and not exactly a great (or artisanal!) holiday gift. That's why I love Ca' Macana. If you go in person to the workshop in Dorsoduro, you'll see artists crafting each mask by hand. But if you can't make it there quite yet, then check out Ca' Macana's online store. Prices are very fair, starting at €19, and if you want to get a loved one a true objet d'arte, you can even pick a full-face mask that would make a gorgeous wall hanging; the one at right is only €59. Please note: All photos in this post, aside from those of Le Tre Ghinee, were provided by the stores themselves and are their copyright, not mine. Looking for the perfect gift for that culture vulture in your life—someone who's loves history, art, engineering, cinema… or even opera? 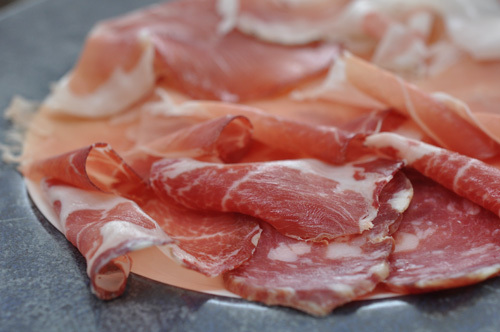 Here are some top gift ideas, with an Italian twist! There are options here for those who live in Italy and those who don't, so whether you're an expat or an Italy-lover abroad, give them all a read. (This is part of a series of holiday gift guides!). You can't "get" ancient Rome without understanding Caesar. So give the aspiring Roman historian in your life Caesar: Life of a Colossus , possibly the most-comprehensive-yet-still-readable biography published of the Big Guy written in the last couple of decades. You don't have to be particularly interested in ancient history to be curious about Cleopatra—minx, stateswoman, and strategist. Stacy Schiff's new, compusively-readable biography Cleopatra: A Life balances juicy stories with a modern take. Pompeii: The Last Day brings it to life with hair-raising dramatizations (and, of course, some history). It's not all factual, but the BBC/HBO series Rome got a lot of things right, including the colorful, gritty atmosphere of Rome in the 1st century B.C. It's also a well-done, dramatic miniseries, one that will keep any ancient history buff addicted for hours. This art supply store in Florence dates back to 1342—and (this is even more amazing) it still sells paints, papers, and other supplies with formulas dating back to the Renaissance. Whether the artist in your life would like parchment skins for illumination and calligraphy, handmade paper for watercolor and sketching, or Renaissance-era paint pigments (lapis lazuli, anyone), Zecchi has it all. And you can both order items, and pay, online—and have them shipped abroad. Check out the Zecchi store online here. If you're lucky enough to live in Italy, and if the art-lover in your life happens to be a child, then check out some of the fantastic programs offered by Arte al Sole. 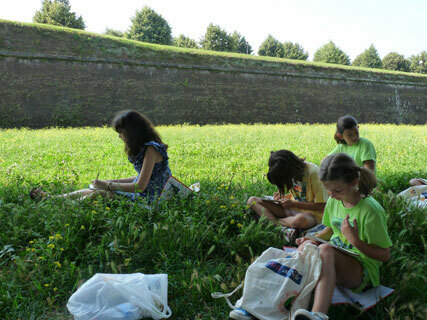 On Dec. 17 through 21, at St. Andrew's Church in Rome, they're running holiday workshops, in English, that take kids (aged 5-13) on an exploration of how Rome has celebrated the holidays, from antiquity up to today. They cost €40 for a one-day workshop or €70 for a two-day workshop; contact Shannon at shannon@italiakids.com or +39 3402140897. Other cool options, and gift ideas, for kids include summer sessions, like five days at the casale of Fontanelle where kids learn about glassblowing, weaving, and more. 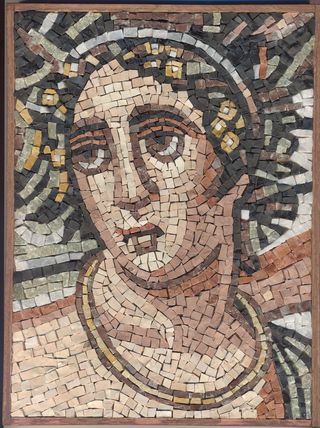 Give the gift of mosaic-making, using traditional Byzantine techniques! loves the ancient art of mosaic, you can give them a mosaic kit to make their own… shipped from a mosaic workshop in Ravenna (the world capital of mosaic!). 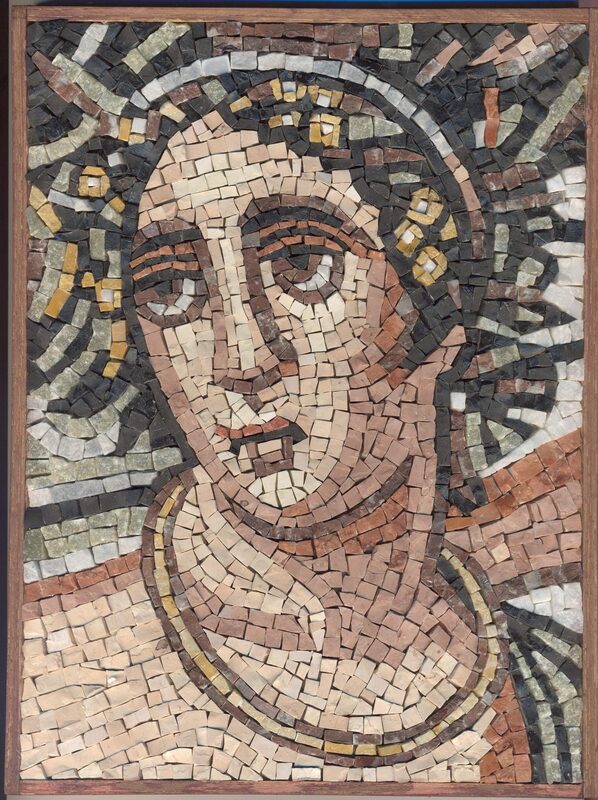 Small mosaic kits (making mosaics that are about 6 inches by 6.5 inches) are just €16, medium mosaics (about 7 inches by 9 inches) are €23, and large mosaics (8 by 10 inches) like this one, right, a reproduction of a mosaic at the Piazza Armerina in Sicily, start from €30. (There are lots of more modern patterns, as well). And yes, the owner has confirmed that she can ship abroad, including to the U.S.
Know someone who's fascinated by Leonardo da Vinci? You've got lots of interesting gift options. Ross King, the writer behind Michelangelo and the Pope's Ceiling and Brunelleschi's Dome: How a Renaissance Genius Reinvented Architecture —both of them must-reads for any lover of art or architecture—just wrote his latest: Leonardo and the Last Supper . It's gotten predictably excellent reviews, and sounds great. Otherwise, I'm itching to watch Da Vinci & Mysteries of the Renaissance , which has Emmy- and Golden Globe-award-winning episodes on Da Vinci, Copernicus, Kepler, Michelangelo, and more. 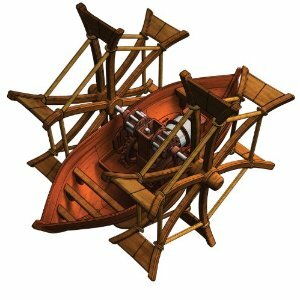 Vinci's designs—like his paddle boat , armored car and aerial screw (the helicopter's precursor)—is a fun option. (Seriously, check out how cool that is to the left!). If you have a serious art history buff, then you can't go wrong with a gorgeous book like History of Italian Renaissance Art —which looks pretty even on a coffee table. No classic film or Rome lover's movie collection is complete without Roman Holiday (clip shown above), the 1953 film starring the gamine Audrey Hepburn and dashing Gregory Peck. The same goes for La Dolce Vita, the Fellini movie that put the Trevi Fountain—and Anita Ekberg—forever in the international imagination. Other musts for movie buffs: The Bicycle Thief (a 1948 film consistently rated as one of the best movies of all time), Il Postino ( the Academy Award-winning 1995 film), and Cinema Paradiso (the gorgeous 1988 film that won the Best Foreign Language Oscar). Oh, not to mention Life is Beautiful, that heart-wrenching yet somehow-uplifting Roberto Benigni film that won the Cannes Grand Prize and the Oscar for best foreign language film. And while Italy's film industry might not be what it used to be, the country is still producing some top-quality movies. Keep the movie-lover in your life up-to-date with the best international films with, say, Il Divo, Paolo Sorrentino's acclaimed drama that's been described as "The 'Godfather' meets 'Nixon.'" Or Gomorrah, the disturbing, gritty, and all-too-true 2008 smash hit on the Mafia's hold on Italy. Or Mid-August Lunch (Pranzo di Ferragosto) , a sweet, funny 2010 film from one of the writers of Gomorrah. Or Nanni Moretti's famous The Son's Room, which won Best Picture in Cannes in 2001. If the opera buff in your life can't get to La Scala… then seeing Verdi's La Traviata Special Edition in Blu-Ray, a top-quality recording of the entire opera, performed on stage, at La Scala in 2007, is the next best thing. Or if you think they'd rather be at the Arena of Verona, there's the 2011 Blu-Ray DVD recording of Puccini's Tosca, filmed of a production at the atmospheric, ancient theater. At less than $10 a pop, they're way cheaper than actually attending these operas (even closer to home! )—not that your gift recipient has to know that. Another great option is Tutto Verdi Highlights, which includes arias from some 20 Verdi operas, all performed by the Teatro Regio di Parma. Obviously, a CD of Italian opera can never go wrong. Especially if it's Pavarotti. Weep, Shudder, Die is a funny, accessible intro to understanding, and loving, opera; Ticket to the Opera is a super-comprehensive guide to 100 of opera's most famous works, with recommended recordings. If you just want to go with the opera-ticket route, then check out the hundreds of opera listings, all over the world, on StubHub. Liked this gift guide? 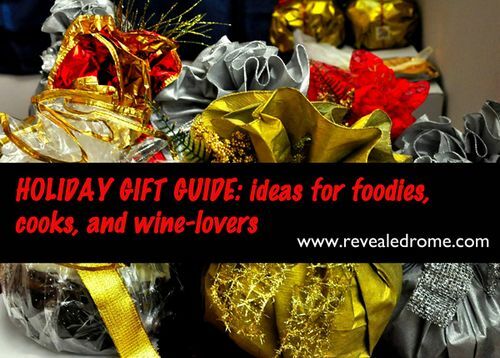 Make sure to check out my gift guide for food and wine lovers and my spotlight on gifts from the anti-Mafia organization Libera Terra! Libera Terra, an anti-Mafia cooperative in Italy, is inspiring, courageous, well worth supporting… and a great source for Christmas gifts. As everyone knows, Italy has a problem with organized crime. Libera Terra is one of the few, and bravest, grassroots organizations fighting it. Since a law was passed 13 years ago, saying that property acquired illegally be given to the community, more than 4,500 villas, farms, and other properties have been seized and returned to the people. Libera Terra, which means "Free Land," sprung up from this law. The cooperative works the seized lands to produce (organic!) oil, wine, pasta, preserves, and other goodies; some of the agriturismi are available to stay at overnight (what a cool way to both delve into the local culture and support a good cause!). And each year, they run international community service camps, and they also often organize demonstrations and awareness-raising events against the Mafia's influence. Think that sounds pretty cool? Me, too. And the good news is… you can support them. And give some cool gifts (including, maybe, to yourself). At the same time. Remember how we talked about all of those gifts that would be great for foodies? Well, add this one to the list. 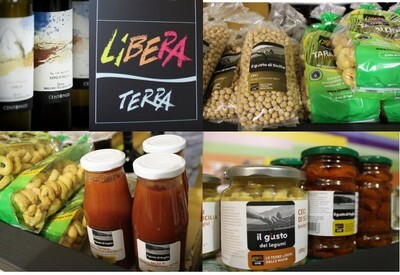 Libera Terra sells all-organic, specialty Italian-food items–like Gragnano pasta, limoncello, marmalade made from Sicilian oranges, taralli, and wine. The prices are extremely fair, too (think €8 for a half-liter bottle of extra virgin olive oil, or €2.75 for a bag of Pugliese tarallini). 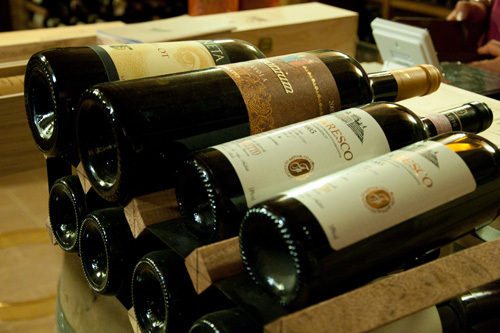 If you don't want to pick items individually, right now, Libera Terra offers several beautifully-packed Christmas gift box options, including the large gift box (12 items, including wine, for €45), the medium gift box (6 items, including wine, for €26), or this set of three southern Italian wines (€23). You can place an order at the online Libera Terra shop; unfortunately, they only ship within Italy. Or, if you're coming to Italy, you can buy goods at one of Libera Terra's botteghe across the country. The newest was just opened in Milan last weekend; there are also stores in Florence, Pisa, Turin, Genova, Naples, and Palermo, among other cities (here's the complete list of Libera Terra shops). In Rome, the store, which is called "'La Bottega dei sapori e dei saperi della Legalità," was actually the first one opened in Italy. It's located at Via dei Prefetti 23; call +39 0669925262 for more. Know anyone traveling to Sicily—or planning to travel yourself? 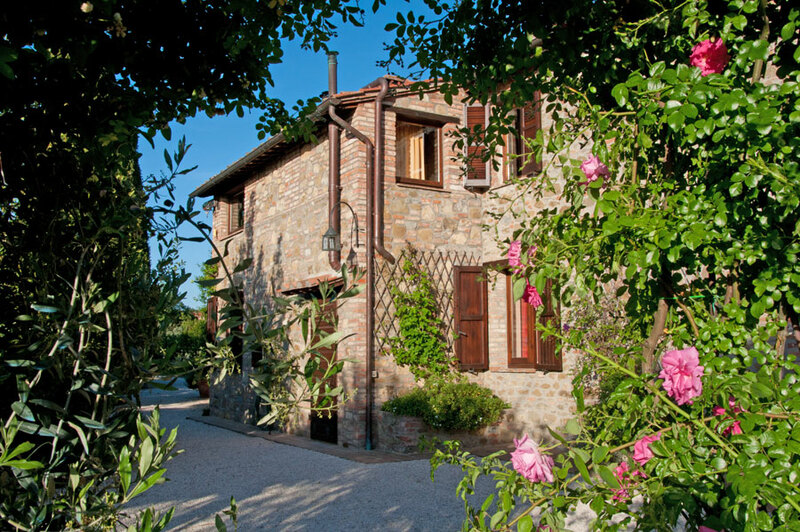 Then give the gift of a stay at one of the agriturismi run by Libera Terra. 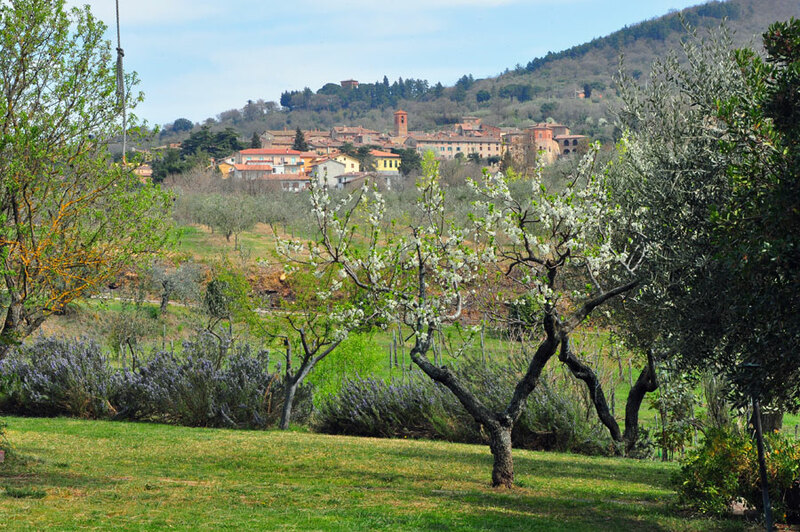 Agriturismi are, in my opinion, Italy's best-kept accommodation secret. These are farms, usually with separate guesthouses, where you can stay overnight. Usually, you have the option of a home-cooked dinner and breakfast. I've stayed in more than 100 of them, and the experiences have ranged—but I haven't had a single negative one. And contrary to misconceptions, no, you're not expected to help out on the farm or with the cooking, and no, you don't have to stay for a week or longer–often you can stay for just one night! So I'm pretty psyched that it turns out that Libera Terra runs their own. And not only do they have two… but they're both in the Corleone province, made famous, of course, first by real Mafia bosses—and then by The Godfather's Vito Corleone. Pretty powerful stuff. You can see their program of agriturismi in English here. 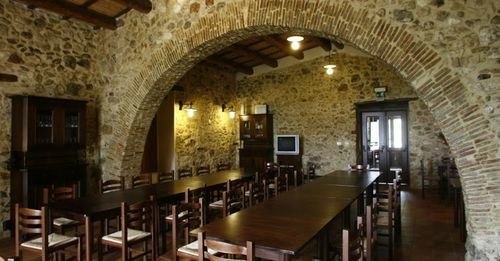 Notable is that at each of the two agriturismi, Portella della Ginestra and Terre di Corleone, all-organic food is prepared with Slow Food principles. 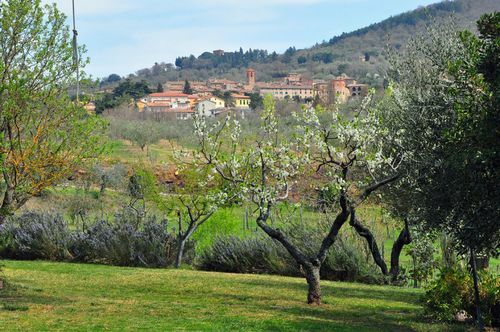 Both are near nature reserves, and the Portella della Ginestra is adjacent to a horse-riding center. Prices—starting at €70 per night, including all meals—are pretty darn good. Finally, if you know anyone who's free Dec. 27-29—or if you are—there's a special "Weekend in Palermo" offered by Libera Terra. 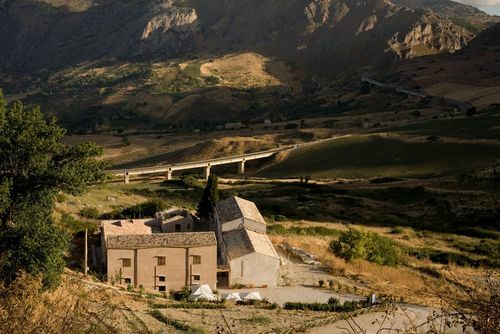 The escape includes two nights at a hotel in Palermo and visits to the Libera Terra-run farms on the Corleone land, all in a small group of just 12 to 15 participants. It's €198 per person. Show your support—and stay up-to-date with what's going on with the fight against criminal networks in the world—by becoming a member (or buying a membership for someone else!). It costs just €1 for a membership for those under 18 and €5 for young people between 18 and 25. For those over 25, it's just €15 for a year-long membership, including the magazine's 12 issues sent in PDF form, or €30 for those who want the magazine sent in print. 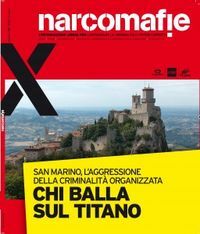 The magazine, Narcomafie, is in Italian, and the print issue only appears to be sent within Italy; however, if you live abroad and speak some Italian, I'm sure they'd be happy to PDF you the files for the cheaper membership fee! Not in Italy right now, but really, really like the sound of what Libera Terra is up to? Then donate! All you need is a credit card, and every little bit helps. Please note that all photographs in this post are used courtesy of Libera Terra. Check out my Italian gift guide calendar to make sure you don't miss a good idea! 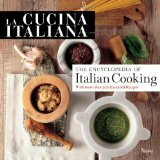 Looking for the perfect gift for someone who loves Italy? Starting tomorrow, I'm going to be running a series of guides on Italy gift ideas. These guides include both gifts that you can order to be shipped abroad, and gifts that you can procure if you're living here in Italy. So I'm hoping both Italophiles here in Italy, and elsewhere, will find them helpful! 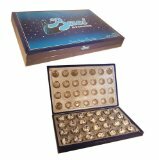 (Update:Don't miss the 2014 Italy gift guides, including the best gifts for Italy-bound travelers and the finest Italian gifts on the web!). Exhaustive? Yes. Helpful? I hope so!